With more than 25 years of experience and over 21 state-of-the-art facilities worldwide, the VSI Group is one of the world’s leading localization companies. VSI localizes theatrical movies, TV series, documentaries, award shows, advertisements and more. VSI’s expert teams possess in-depth knowledge and cultural understanding of global brands across all industry sectors, making it the ideal localization company to help businesses grow international sales. Voice and Script International (VSI): One of the world’s leading translation and localization recording companies. VSI is a global service provider for all language needs, offering lip-sync dubbing, voice-over, subtitling, translation, post-production, creative and access services. Project Scope: Before designing and building their new Los Angeles studio complex, VSI general manager Alex Weiser contacted Jim Pace, president of Audio Intervisual Design (AID) to find the ideal location in Sherman Oaks. 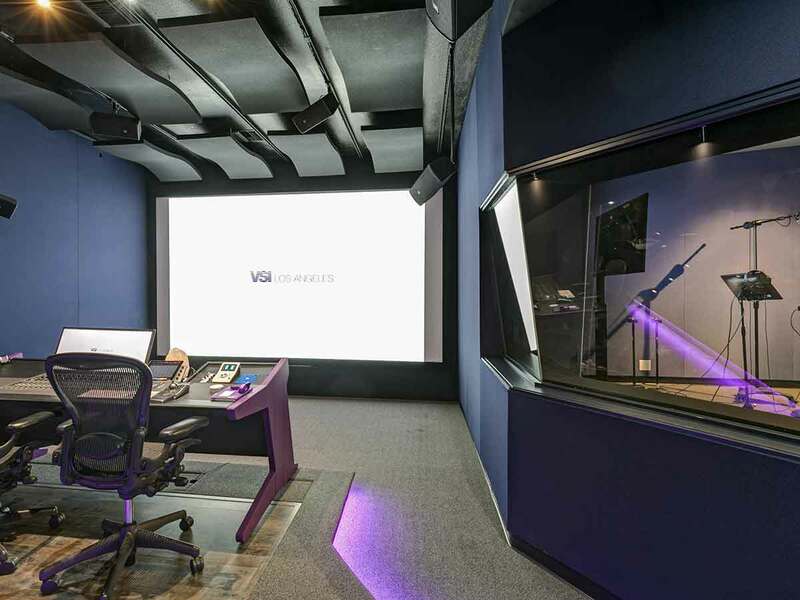 Pace and the team at AID worked with Weiser and the VSI London headquarters team to design and create the three-control room complex, which has two recording spaces and the ability to record both voice and musical instruments, as well as other post-production operations. VSI required the ability to mix, author, and QC in the Dolby ATMOS Home Theater format as well as create conventional 5.1 and 7.1 deliverables for thier clients. Integration: AID worked with VSI to transform a mixed use office & production space into a state of the art post facility by providing design and installation services, as well as coordination of construction and acoustic services. The physical layout of the facility centered around a centralized machine room area housing all the audio, computer, and production IT equipment. The network topology focused on creating switch fabrics ensuring sensitive production data could be isolated from corporate and external web traffic. The focus of the centralized design was to allow VSI to meet the future and current security needs of their clients. The two large re-recording spaces are equipped with AVID Pro Tools to act as both control rooms for the VO and Music recording booths as well as service conventional mix duties. The facility design includes Dante IP audio and flexible HDMI patching, allowing the rooms to be easily reconfigured by VSI Engineers for whatever client needs require. The larger of the two re-recording spaces is equipped with a 9.1.6 Home ATMOS rendering configuration. Utilizing the JBL Intonato monitor controllers and DAD router, the monitoring configuration of the room can easily be re-mapped from ATMOS to 5.1 to Mono with a few mouse clicks. A conversation with Alex Weiser, General Manager, North America and Oscar Garcia, Staff Audio Engineer, conducted by David Goggin with Jim Pace, President of Audio Intervisual Design. 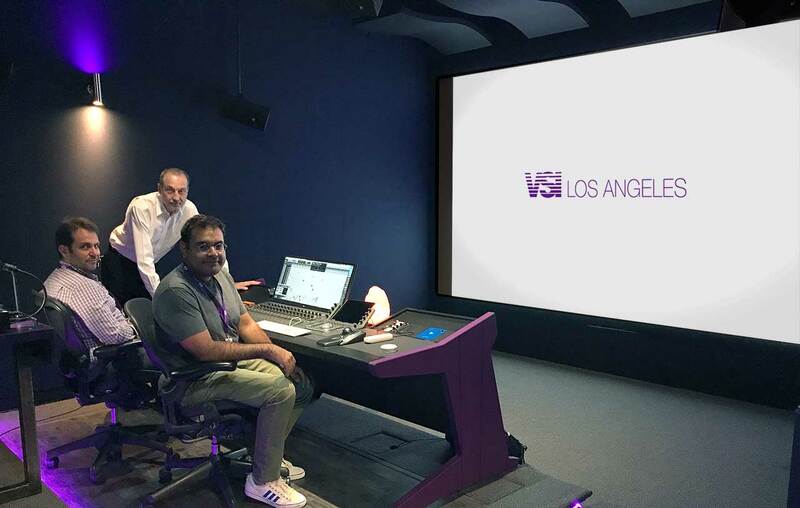 Pictured (L-R) at Voice Script International in Los Angeles are Alex Weiser, VSI General Manager N. America; Jim Pace, President of Audio Intervisual Design, and Oscar Garcia, VSI Staff Audio Engineer. Photo by David Goggin. 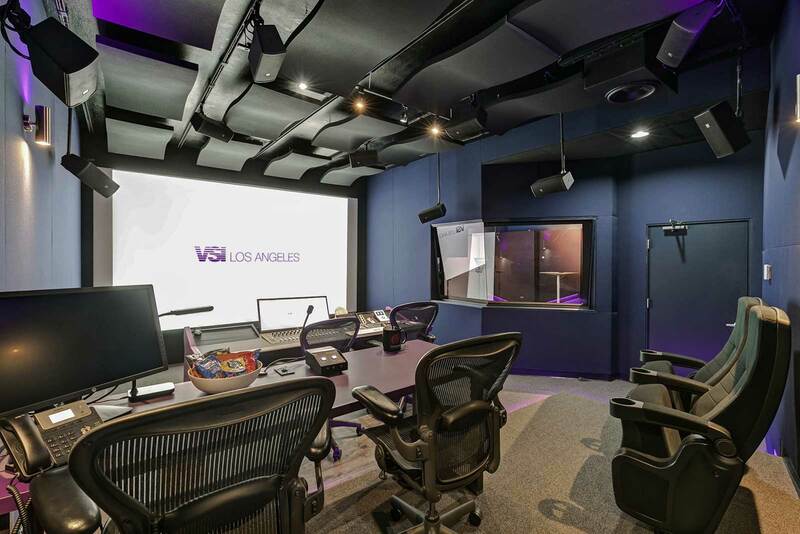 David: How did Audio Intervisual Design contribute to VSI’s new headquarters in Los Angeles? Jim: Well, VSI General Manager, North America, Alex Weiser first contacted us in 2016 and we helped him find a location for the new facility in Los Angeles. After looking at more than a few possibilities, Alex settled on this location here in Sherman Oaks. We then worked with Alex and his team from London to help organize what the facility could provide for their services here in the Los Angeles area and worldwide, since they’re part of a 21-facility worldwide network of facilities headquartered in London. The scope of the project was initiated in January, 2017, and as information about the new facility and their customers became known, the project got bigger and bigger until it became what it is today: a three- control room studio complex with two different sized recording spaces, the ability to record both voice and musical instruments, as well as other post-production operations. One of the requirements was the ability to mix in professional Dolby ATMOS format for home theater. We’ve been involved in either equipping, designing, installing and integrating over (40) ATMOS mix rooms and fully one third of any new rooms are immersive. This is a 9.1.6 space featuring JBL & Series monitors. David: Are these three LA studios meant to emulate the other studios around the world so that there is compatibility with all of your locations? Alex: Yes. Every studio in the group is equipped with ProTools, an international standard for audio recording and mixing. In addition, we have standards of quality that go across the board, and we sometimes mix material here that has been recorded abroad or vice versa. We can also mix several versions of certain content centrally for consistency and quality. The VSI group has been very successful in some challenging regions. We handle localization in countries in Eastern Europe and the Middle East where we had to raise the bar of quality, so it’s important to have strong hubs like this one where we can provide quality control and deliverable prep before sending material to the customers. David: Can you elaborate on the meaning of localization? Alex: Most content nowadays is exported internationally to many countries. Lately the platforms have gone global, so it’s very important to translate that content into and from foreign languages. We provide dubbing and subtitling services. Some territories are keen on one or the other, or both. It also appears that now when people watch TV, for instance, everyone is doing something else, either on the computer, on the tablet, on the phone, so you don’t want to miss one subtitle. This is why dubbing is very important as well. David: Do you have script associates translate into a specific language and then you have a native speaker come in to record? Alex: Yes, when we do dubbing we have actors coming in, and each actor is dubbing one of the domestic roles into that foreign language. Jim: Let me elaborate a little bit. The idea is that VSI is working with professional voice talent that’s being directed as part of the creative process so that the original script and original content is mirrored as closely as possible, even though the languages are different. Oscar’s involvement as a recording engineer and producer is to help make sure that vocal believability occurs, which requires a special sensitivity and experience. It requires knowing the abilities of the talent, getting the right talent in, and also working with directors to accomplish this. With their multi-facility locations around the world, there is a lot of interaction. It really is a global company with a high-end hub here in Los Angeles. David: Specifically what technology did you oversee? Did you help in the design of the rooms, the acoustics, and the equipment integration? Jim: We worked in conjunction with their very strong London tech staff to help develop the systems and the workflows. We worked with their staff and their design ideas that were incorporated including acoustics. All the electronics and design flow were co-engineered together. We took the lead on certain areas that were Hollywood-centric, with the idea that we know how operators and facilities work here and what the expectations might be for some of the clients and the talent that they bring in. They gave AID direction; we provided the tools and the execution, and then we were involved in finding the right people that actually make it work. Oscar’s skill level is intrinsic to all this. It was team collaboration, utilizing the particular elements that we brought and the ideas that we could actualize and provide an entire set of services. We helped with the design, we did the integration and we did the system builds and the installation work. Not only with wiring, but also with programming and other factors, because this is truly a very modern facility, on the cutting edge and state of the art in many ways. For instance, this was one of the first facilities in the world that Dolby allowed involving smaller vendors. The “Atlantic” ATMOS stage is equipped with a Dolby RMU, Rendering and Mastering Unit, one of the very first facilities to feature that. We also have incorporated some new technologies from JBL Harman that are becoming commonplace in the high-end of the industry here Los Angeles. And there is a complete Dante backbone for certain applications and certain needs. Alex: What needs to be underlined is that the facility has been designed in a very innovative way. We have a complex system, and one that is also very flexible. We use the Dante Protocol that is basically allowing us to interconnect any of our rooms together. It’s all over an IT network, audio over Ethernet, which allows us to plug any device in anywhere, and they can all be connected together. David: Well that’s important, because otherwise you get out of date fast. Alex: Exactly, yes. I think it was a perfect match, because I feel many times people may be a bit conservative in trying new gear out, in being the first one to try out new technology. Thanks to Jim’s introduction, we worked hand-in-hand with the manufacturers, but it was not always easy. Sometimes people stayed late. But right now we’re very happy with the systems we have in place. David: Oscar, let’s hear from you about the way this facility operates and the operational learning curve from beginning to end. Oscar: The starting point was the Dante. It was a newer system that I had heard of, and it was starting to take off in Los Angeles. The entire studio now rests on that. It changes how you think studios traditionally operate. Just because the equipment is in one room, it doesn’t necessarily mean it is only operating in that room. It could be connected anywhere else. Once we understood the Dante workflow, that was the beginning of this studio. Then from there it was just building blocks on top of that. As far as the workflow goes, it’s working seamlessly now. We’ve been able to expand upon things that I was doing in other studios, trying new things, and it’s very easy to do that here. We can now easily experiment with new workflows and methods for trying to push the talent further to what they can do, while still doing it within the timetable set by our clients. And we’re experimenting, talking about doing things in new ways on future work. We’ll see how it goes, but we’re able to do it, and we’re able to do it pretty easily just because of the technology that we’re using now. It’s enabled us to expand and experiment. Jim: Could you talk a little bit about each of the rooms? Oscar: Sure. The main room is The Atlantic Atmos. We’re using it right now for a mix, but it’s also our main recording room because it is attached to our largest isolation booth. For instance, if we want to do a mix, we start here, because this is our most ideal room to mix and because it has a large sort of theater stage with a projector screen. I can position the recording engineer and director in an entirely different control room, while still recording from the record booth into that control room. Meanwhile, I can mix away and there’s no problem. There’s no bleed or anything like that. You just keep working and it’s all seamless. The configuration can be done in any way you want. Atlantic is my favorite room for doing big film projects, because it bears a closer resemblance to a theater experience. A second room we have is called Pacific, which is a little bit smaller. To me it resembles a TV mix recording stage. It’s still a 7.1 stage, so you can do big theater mixes in there for movies or television, movies for the web, Netflix. The Pacific room is great, with another booth attached, and it’s all Dante connected so you can configure forward and backward however you like. Then we have a third room, which we call the Baltic. The Baltic is a smaller sort of edit room, control room. However, it still has the capabilities that Pacific and Atlantic have in terms of recording. You can put recorders and the director in there to record talent from any one of the booths or both booths at the same time to get the work done, while both other stages are mixing. The possibilities are there and in that way we can double up on capacity as well, so we’re not restricted to just segregate one room to record all day. We can change things up. All three rooms sound great. We had the benefit of Dolby coming here and tuning the rooms. In Atlantic, I’ve been doing most of mixing and I’ve had really great success translating mixes to other places. I did a movie mix here a couple of weeks ago and played it back at a completely different locations, and it was flawless. It was amazing.